I am an avid reader, primarily fiction. Best book I’ve read in the past year was The Descendants. Mostly alone due to time & family restrictions but I prefer to run with friends. The difference between a jogger and a runner is an entry form. 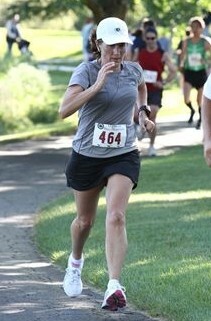 With high cholesterol and a family history of heart disease, I run to maintain my health. 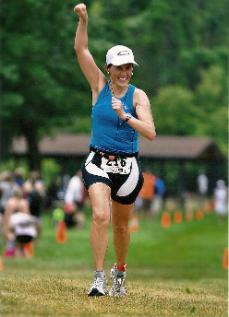 I also run because I love setting goals and trying to achieve them. I am an analytical “numbers” person and love nothing more than analyzing splits post-race. Running is a great way to stay connected to my friends, locally and cross-country. There is nothing better than a destination race weekend with your running crew. As a birthday gift to myself I decided I was finally going to break 4 hours for turning 40. I had a great race but stopped checking my watch after 21 miles because I was sure I would make it and just wanted to enjoy the last few miles. At the 26 mile mark I looked down at my watch and realized I could possibly qualify for Boston. I ran my heart out the last .2, and missed qualifying for Boston by 7 seconds. I totally exceeded my wildest expectations, pr’d by 17 minutes and couldn’t believe I got that close to Boston. I have always been surrounded by strong runners who have pushed me beyond anything I thought I was capable of. Although I am just starting as a pacer, I feel that I am a seasoned distance runner who has faced a myriad of racing conditions and challenges, and now run smarter and stronger than ever I have. I’d love to share that passion and encouragement with more people. 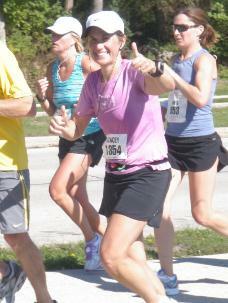 In my first official marathon as a pacer, I had numerous runners come and go from my group. Three gals stayed with me from start to finish: one was a first-timer who chatted the entire time, one was a veteran going for a pr while listening to music, and the third was also a first timer who glued herself to my side but rarely talked. With less than a mile to go, we approached the final aid station where I stopped to grab a quick drink. All three of them came to a standstill even though none of them were drinking. I yelled GO, GIVE IT ALL YOU GOT thinking they were ready to pick up the pace and run ahead of me! They turned and said they weren't going anywhere without me. I realized how much my presence was motivating them and we all ran to the finish together for two first time happy finishes, one pr, and one proud pacer, finishing right at goal pace time with a huge grin on my face knowing I made a difference. I am here to support you and help you achieve your finish goal. I am happy to chat or just be your pace car while you ride along with the group. Respect the distance. You can’t finish a marathon by wishing for a fast time. You need to train and have realistic goals. 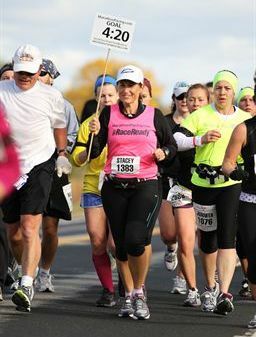 Marathons are hard for everyone, even the winner, so join my group and we’ll get there together. I have lived in Hawaii and Northern California so if you want, we can plan your next vacation (or destination race) during the marathon. I am also known for researching races to death. Ask me about one and see if I know anything. As a mom to younger kids, I spend most of my free time volunteering at school and with the PTA.